The China (Shanghai) Pilot Free Trade Zone (SHFTZ), located in Pudong New Area, is a regional free trade zone founded by the government of China. It was established on Sept 29, 2013 and originally consisted of Waigaoqiao Free Trade Zone, Waigaoqiao Free Trade Logistics Park, Yangshan Free Trade Port Area and Pudong Airport Free Trade Zone. The State Council decided on December 28, 2014 to expand SHFTZ by incorporating Lujiazui Financial and Trade Zone, Jinqiao Economic and Technological Development Zone, and Zhangjiang Hi-Tech Park, enlarging the SHFTZ from 28.78 square kilometers to 120.72 square kilometers. The bonded area of Shanghai FTZ was officially founded on Sept 29, 2013, upon the approval of the State Council. 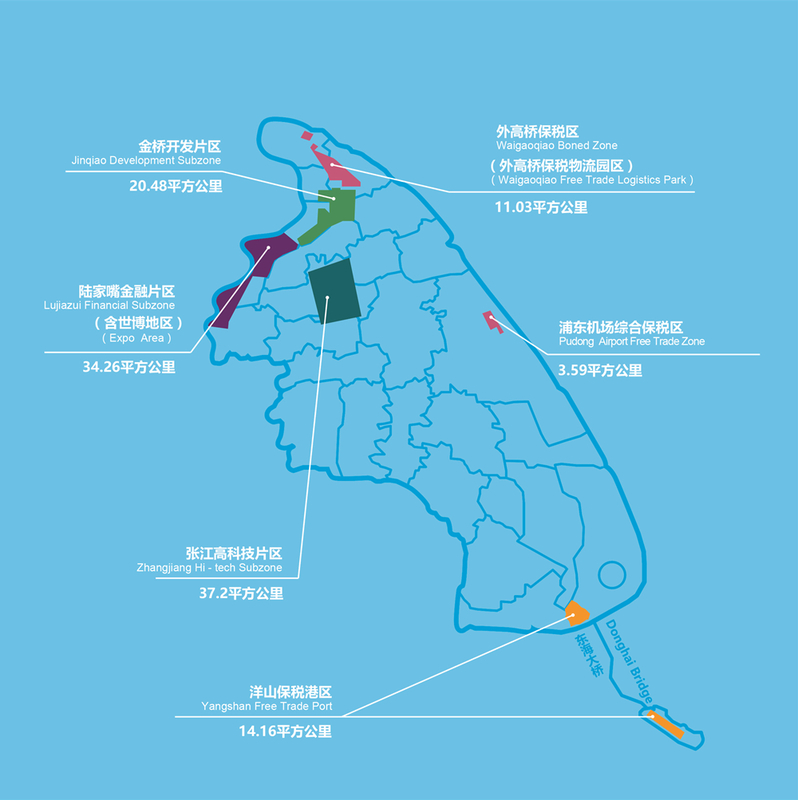 It consists of Waigaoqiao Free Trade Zone, Waigaoqiao Free Trade Logistics Park, Yangshan Free Trade Port Area and Pudong Airport Free Trade Zone and occupies a total area of 28.78 square kilometers. It is a pilot area where to carry out the reform measures in terms of the transformation of government functions, financial system, trade services, foreign investment and tax policy. The zone also boosts the development of port and offshore businesses in Shanghai. Lujiazui Financial and Trade Zone consists of Lujiazui Finance and Trade Zone and Expo Development Park. Stretching from Jiyang Road and Middle Ring to Hangpu River, the area covers a vast ground of 34.26 square kilometers. The Lujiazui Finance and Trade Zone occupies 24.39 square kilometers. It is the core of Shanghai International Financial Center, Shanghai International Shipping Center and Shanghai International Trade Center. Work is under way to establish a financial system that follow international rules and practices, attract the headquarters of multinationals with fine services, and carry out reforms to facilitate foreign investment, cross-border trade, international financing and market supervision, and create a good legal environment for businesses. Jinqiao Economic and Technological Development Zone is located on the 20.48-square kilometer ground encircling by Outer Ring Greenbelt, Jinxiu East Road, Yanggao Road and Jufeng Road. It has become a showcase of advanced manufacturing, production services, emerging industries, and eco-friendly environment. The zone is focusing on administrative and financial reforms, creating good business environment to facilitate trade, fostering strategic growth industries for sustainable growth and international competition, and promoting energy and creation capability to achieve economic development. Zhangjiang Hi-Tech Park, occupying some ground of 37.20 square kilometers, stretches from Outer Ring Greenbelt and Shenjiang Road on east to Luoshan Road on west and from Outer Ring on south to Dongdong Avenue on north. It is a base for innovations as Shanghai implements the national strategy for sustainable growth. The area combines the development of Shanghai FTZ and the Zhangjiang National Innovation Demonstration Area with a focus on enhancing its innovative capabilities, developing National Science Center and economies featuring new technology, new industry, new form and new model, providing a service platform for technical innovation, scientific and technological finance, and talent recruitment, and promoting integrated environment. The Expo Area is a key part for Shanghai's new round of development where headquarters economy, shipping finance and high-end service industries are under rapid development. 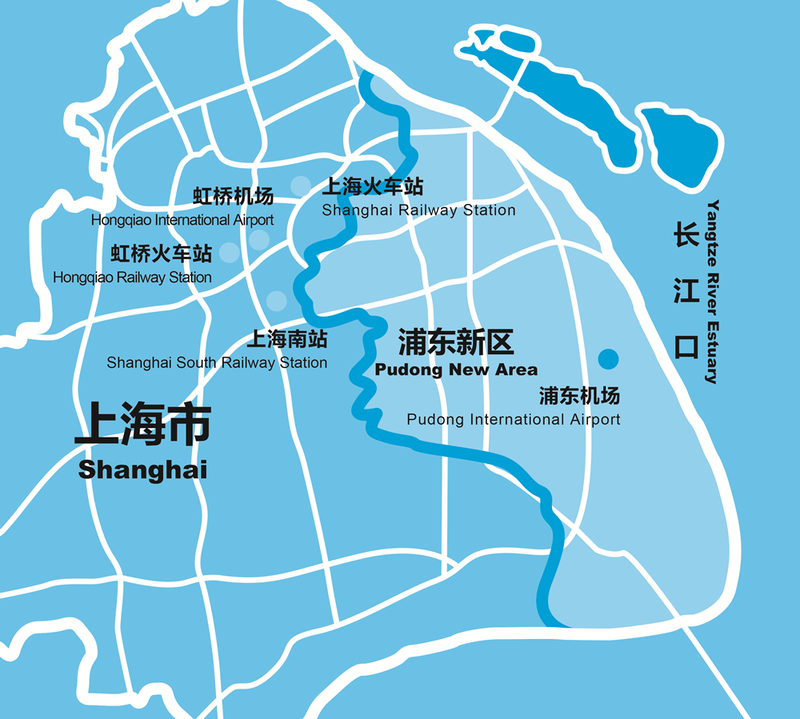 It consists of Pudong, Yaohua and Foreshore land parcels. Centering on core function of international exchange, Pudong land parcel is a public activity center featuring culture and expo creativity, headquarters business, high-end conference and exhibition, tourism, entertainment, and ecological dwelling. Yaohua land parcel is designed to be a waterfront functional zone that specializes in entertainment culture, tourism, and ecological construction with emphasis on business, commerce and modern dwelling. Foreshore land parcel prioritizes the development of headquarters business, culture and sports media, and sports leisure, with the aim of becoming a gathering place of headquarters of non-financial multinational corporations and headquarters of enterprises under transformation. It strives to become a world-level center activity zone together with Expo Park.